Kai Chase's testimony provided a look into the lives of Jackson's three children before and after their father's death in June 2009. 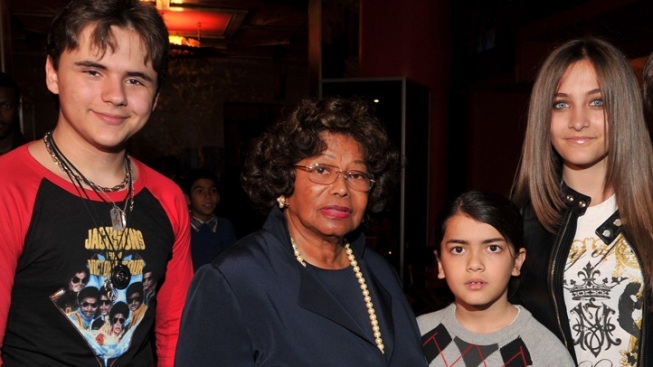 Michael Jackson's children Prince Michael (l.), Paris Jackson (far r.), Blanket Jackson and his mother Katherine Jackson. Michael Jackson's personal chef described for jurors the home lives of the children during the final months of the singer's life and their ongoing grief over their father's death nearly four years ago. Gone are the freewheeling days when the children, Prince, Paris and Blanket Jackson played with their father and traded jokes at the dinner table, chef Kai Chase told jurors Tuesday. It has been replaced, Chase said, by a weight on eldest son Prince Michael Jackson's shoulders. Daughter Paris Jackson cries and no longer wants parties for her birthday since her father hosted a private circus for her 11th birthday. Youngest son Blanket, who remains home-schooled, wears a T-shirt with his father's image every Friday, she said. Chase recounted for jurors her interactions with Jackson, his children and her ongoing work with the singer's mother and children for jurors hearing Katherine Jackson's negligent hiring case against concert promoter AEG Live LLC. The company denies all wrongdoing. In Times Square for the "World War Z" premiere, Mireille Enos talks about her whirlwind tour to promote the movie. Also, she talks about working with co-star Brad Pitt. After weeks of testimony about Jackson's business dealings with AEG, Chase's testimony returned the trial's focus to the King of Pop and his offspring. "At 16, the weight of the world is on his shoulders," Chase said of Prince Jackson, who is trying to figure out girls and all the challenges adulthood brings. His younger brother, 11-year-old Blanket, has his older siblings to shield him from pain but had the least time to spend with his father. "He never really had a time when it was father-son because he was so tiny," Chase said. The singer's only daughter seems to be having the hardest time, Chase said. "Being daddy's little girl, Paris is devastated," Chase said. "She's devastated and lost." Chase's testimony provided a look into the lives of Jackson's three children before and after their father's death in June 2009. Michael Jackson was fiercely protected of their privacy, often using masks to hide their faces when they were in public. She now has daily interactions with Jackson's children since being hired to serve as their chef in July 2012. Of Paris, she said, "She's trying to find herself and find who she is," Chase said. "It's taking a lot of love and understanding to keep her together. She breaks down, she cries, she talks about him." Earlier in her testimony, she described an April 2009 birthday party for Paris that included a private circus. The Cirque du Soleil-style show featured men on stilts and a woman performing in a giant balloon, Chase said. Paris Jackson, who was turning 11, adored her father and Chase helped decorate a room filled with posters and photos of the "Thriller" singer. The singer's music was played throughout the party. It was the last birthday party the 15-year-old has had. "Paris hasn't had any birthdays since," Chase said. "She hasn't wanted to celebrate since." She described the routines in Jackson's home in the months before his death, describing him as a vibrant and hands-on father. But by June 2009, Chase said Jackson was deteriorating and she witnessed Prince having to help his father up a staircase to his bedroom. She said she met AEG executives at the center of the case, including chief executive Randy Phillips and executive Paul Gongaware, when they came to Jackson's home for meetings about the singer's ill-fated "This Is It" comeback concerts. One tense meeting in June started with a vase being broken — she didn't know by whom — and with Jackson and his personal physician storming out. The doctor, Conrad Murray, told her as he left the home, "I can't take this (stuff.)" She described the Jackson family dynamic in happier times at the home. The entertainer wouldn't allow his children to eat sweets and made sure they went to bed early so they would be alert for tutors who instructed them. Chase described Jackson as a prankster who ate meals with his children, exchanging jokes and stories. When the singer entered the room, his children would run to their father when he came into a room. "They would take off like lightning," she said, hugging their father's ankles and legs. If jurors determine AEG Live is liable for Jackson's death, they will have to determine any damages awarded to his mother and his children.